FILE - Displaced Syrians are seen at a camp near the border crossing with Turkey in the northern part of Syria's rebel-held Idlib province, Sept. 6, 2018. A Russian-Turkish agreement to create a demilitarized buffer zone between the Syrian army and rebels inside Syria's northern Idlib province has averted a war for now, according to a senior United Nations official. Earlier this week, Russian President Vladimir Putin and his Turkish counterpart, Recep Tayyip Erdogan, agreed to set aside a large area along the border between Turkey and Idlib to potentially protect some 3 million civilians from attack. Turkey already shelters more than 3 million Syrian refugees and fears a massive exodus into its territory if Idlib were under attack. Jan Egeland, a senior adviser of the U.N. special envoy for Syria, says he was informed of the agreement's details during a meeting of a U.N.-backed task force on humanitarian access in Syria. Egeland says he feels relieved the countdown to war was stopped at the "11th hour." Egeland says the threatened military onslaught by Syrian and Russian forces to retake Idlib, the last rebel-held enclave in Syria, would have risked the lives of the civilians, including one million children. He says the Russian-Turkish agreement bought more time for diplomats and politicians to protect civilians inside the buffer zone and avert a catastrophic humanitarian disaster. "What I understand is that the so-called war on terror is not called off," Egeland said. "On the contrary, there will be in the future, air raids against the listed organizations. There will also be fighting between armed groups, armed actors and the so-called terrorists, the so-called radicals." 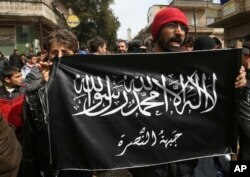 FILE - Protesters hold an al-Nusra flag as they shout slogans during a demonstration in Idlib province, northern Syria, March 1, 2013. Under the deal, Egeland says only al-Nusra and other U.N.-listed terrorist groups can be attacked. These groups, which number about 10,000, will be moved outside the buffer zone, he says, adding that other "more moderate fighters" supported by Turkey will not be attacked. Egeland warns that the terrorist groups will be scattered in different parts of Idlib, which is cause for alarm. Many of the groups vow to fight to the end, he says, but efforts will be made to reach out to them to try to get them not to fight to the last fighter and not to fight to the last civilian in their areas.